Take action! Stop Bill C-51 before it’s too late! Bill C-51, the Anti-terrorism Act, 2015 has been voted at 3rd reading in the House of Commons on May 6th, 2015. It is now in the Senate. Even after two national days of protests all over Canada, a drop in support for the bill from 82% to 33%, more than 205 000 people having spoken out online against C-51, the Conservatives are still refusing to listen to the majority of Canadians and are pushing this reckless, dangerous and unnecessary bill through Parliament with as little debate and amendments as possible. Tell the entire Senate to reject Bill C-51. At this moment, 15 Senators have publicly committed to oppose Bill C-51, 5 have said they will vote for the bill, and 62 are still undecided. Help them decide! Tell your Senator to reject fear and stop Bill C-51. If you are a conservative or a libertarian, please sign this letter against Bill C-51. Attend one of many events across Canada on the 3rd National Day of Action against Bill C-51. Spread the word by sharing this on social media. This entry was posted in Past actions on 5 May 2015 by ICLMG CSILC. The third and final vote on C-51 will occur shortly after Parliament resumes on April 20. From April 13 to April 20 people across Canada will step up for a Week of Education to Stop C-51. 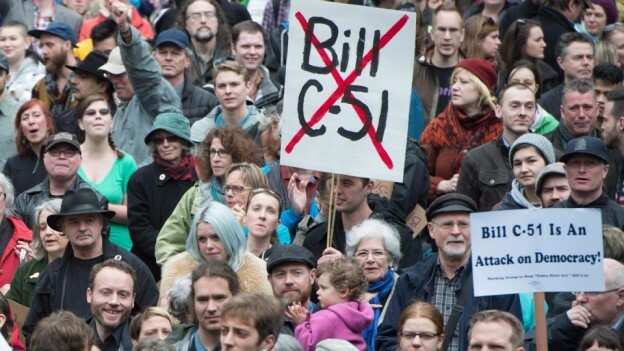 We know that the more Canadians know about reckless bill C-51 the less they like it. Use the resources on this page to join in the action!